Is it too early to start thinking about 4th of July desserts? I mean, I haven't even put up my Independence Day decorations yet, but I've been running down the menu in my mind for at least 2 weeks now. We're attending a combination birthday and early 4th party next weekend and I also need to bring a dish to that event. Since it's out of town, I needed to think of something that would be enjoyed by all and would travel well without spoiling. 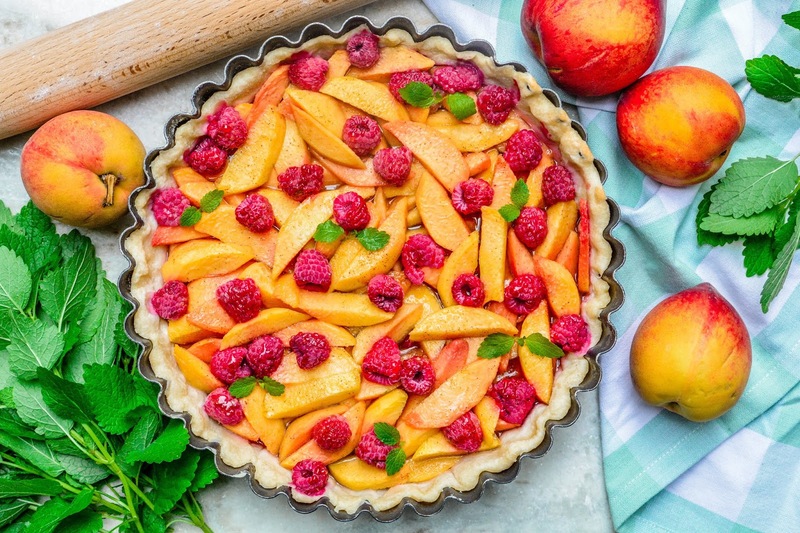 Chocolate would probably melt on the way and anything with dairy wouldn't hold the whole trip, but I found the perfect solution with this Raspberry Peach Tart from Golden Blossom Honey. Made with just 5 simple ingredients, this recipe is not only easy to make, but delicious too. I used my tart pan and a homemade pie crust, but if you want to save even more time, just grab a pre-made pie shell from your grocers freezer and it will turn out just as good. 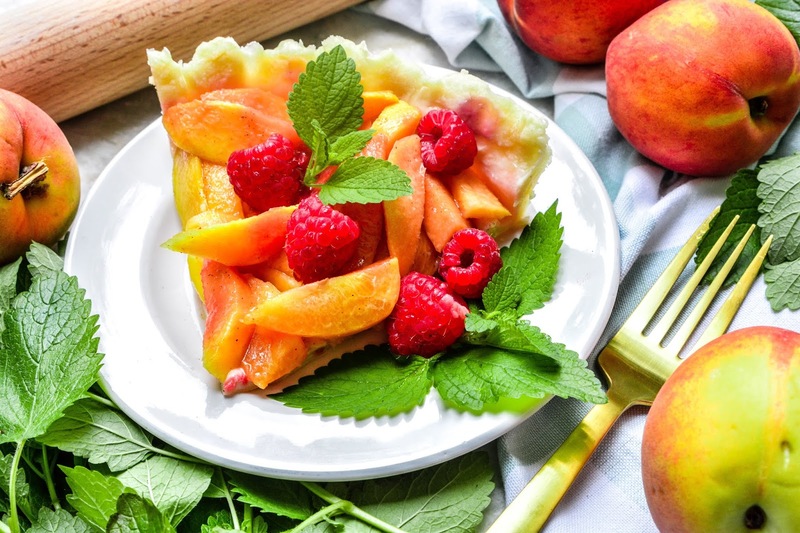 This fruity tart will be perfect for your 4th of July BBQ's and picnics, or just keep the recipe on hand for when you have leftover summertime fruits. You can never go wrong using up your extra fruits in a tart like this! What are your favorite summertime fruits? Great one to tag along without risk of spoiling indeed. But you without decorations up? Geez, you're slipping. I finally got them up, a week before the holiday. I am slacking! That is soooo tres gorgeous, dahlink! What a lovely setting and stunning combination of colours! My raspberries are done for this year, but I'm looking forward to the arrival of peaches and nectarines! Where on Earth did you find nettle? Did you make soup from it? It is extremely healthy! That's not nettle, but mint from my garden. It does look like it though. I hope you were able to get a nice bounty from your raspberry bush this year! WOW! The presentation in your pic is AMAZING! It looks so delicious! This will be a great dessert to make for the 4th! That looks amazing! I love these flavors. 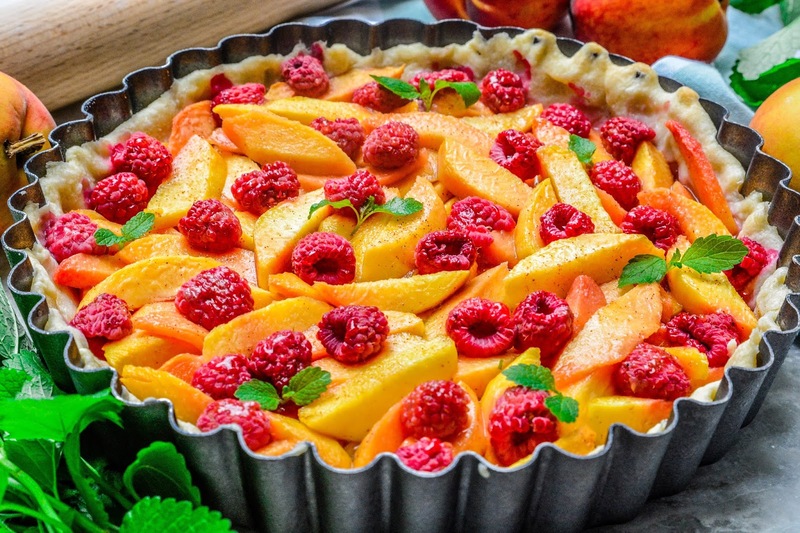 Raspberry and peach are classic summer fruits, and this tart is so light and tasty looking. I love your pictures, that looks really good. Oh, there's a peach festival this weekend that i want to go to. I would love to make your dessert here - it looks so good! I think a peach festival sounds like a lot of fun! Considering I've been picking mulberries, I guess that's my fruit. I always swipe those from my neighbors bush that hangs over into our yard. She never picks them herself, so why let them go to waste? This looks great by the way! In my opinion it is never too late to think of dessert. I love this for the fourth of July because it's colorful, fruity and festive looking. I'm sure it's delicious, too. This looks like a really delicious dessert. I have always preferred fruit tarts for dessert and your recipe is fantastic. I am pinning and saving this for later. That is an absolutely gorgeous dessert for summer! I would love to give this a try on my own! Your photos of food are always so mouth watering! I love your raspberry peach tart. Looks really delicious! Loving this dessert! I really adore adding fruits to desserts like this especially during the summer. This looks SO delicious!!! I live for summer when we get all of these beautiful fruits. I am always baking up a storm this time of year! I bet the raspberry and peach is a delicious combo for a tart. And of course you knew just how to add that honey! It is such a sweet and delicious combo! Oh that looks so pretty and colorful! Almost too pretty to eat...but only almost. ;) My favorite summertime fruits are strawberries, peaches and watermelon. I love those too, but I have to add blueberries to the list. I always throw summer blueberries into my smoothies and oatmeal in the morning. It's never too early to start thinking about 4th of July desserts or desserts in general for that matter. We need to invent one that makes people lose weight. We'd be rich and move to that Bora shora. Yes, we would. No? OMG! This looks delicious! I’m definitely going to be making this.